Ron Honyumptewa is from the village of lower Moenkopi located east of Tuba City, Arizona. He comes from a family of fine Katsina carvers and is humbled and thankful to his uncle, Tom Holmes, who is now deceased. Ron use to watch his uncle Tom and his cousins, Leonard Selestewa and Jon Cordero, who are also known for their Katsina dolls. Ron mentioned back in 1987 that he was watching his Uncle Tom carve and stated to Tom, he wished he knew how to carve. His uncle told him, “you are not going to learn by watching”. That was the beginning of Ron learning how to carve with the guidance of Tom, Leonard and Jon. Ron first started by making female katsinas and later moved onto to carving different katsina. 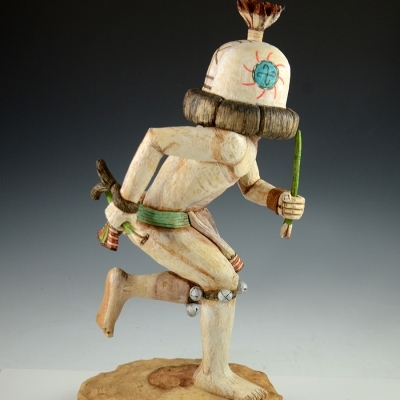 Ron is known for his motion, flow and action style katsina dolls. He is also known for his turkey katsina and has mastered the motion and flow of his katsinas he creates. Ron has also learned from his uncles, Stetson Honyumptewa and Loren Phillips and to this day still receives guidance, inspiration and encouragement from both his uncles. 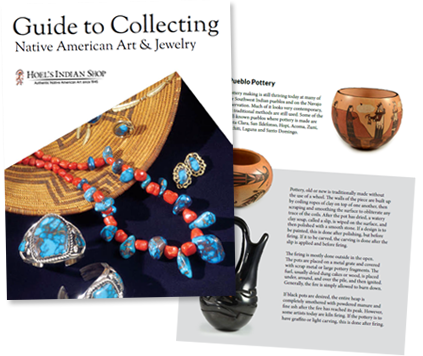 Ron was won awards at Gallup Inter Tribal, the Heard Museum, Prescott Indian Art Show and 1st place at the Arizona State Fair and Mayors Award. Ron was invited to showcase his artwork at the Smithsonian Museum in Washington, DC. He declined due to his career in Law enforcement. Ron states that he wished he had attended the Smithsonian Museum but at the time, his job was to protect the community he served. Ron has never stopped making katsina dolls and he has the passion to continue to improve as well as teach his nephews to carry on what he has learned.